The garden is open for visitors every day, all year around. From June 24 until August 11, the names of the plants are displayed on signs in the garden. Botanically educated guides are working during daytime in the garden throughout this time. They take care of the plants and will be glad to answer any of Your questions. The entrance fee for the garden is 30 SEK for persons over 15 years old and is paid to the guides or in one of the payment boxes at either of the entrances. Persons under the age of 15 visits the garden for free. The garden is easy and interesting to visit even if You are using, for example, a wheel chair. 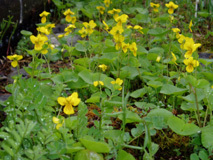 grows in generous quantities in the botanical garden and blooms in the early summer. 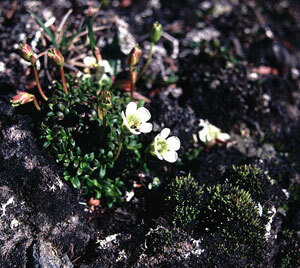 The Diapensia Diapensia lapponica grows in the Scandinavian mountain range and in the northern parts of Iceland.